How heavy is your load? Read more about How heavy is your load? Checking out this new site to see if it will be truly useful. Now days, everything you buy comes from everywhere. That means events anywhere can affect price and supply. Consider these stories from the last month. Walmart is lowering prices on staples in at least 1,200 Midwest U.S. stores to compete with other grocery chains, which is causing a price war in Iowa and Illinois. At some stores a gallon of milk costs around $1 and a dozen large eggs cost less than $1. Executive order signed by President Obama on March 16, 2012 titled "National Defense Resources Preparedness" makes clear that in the event of a nationally deemed emergency all of resources will fall under the authority of the United States government. Ok, so what do you do in the backyard on a 85-F afternoon in September? Play around creating fire-starters, what else? I've played around with quite a few, and apart from good ole fashion "fat wood", I found these commercial Mini Inferno jobbies from the Self Reliance Outfitters to be the easiest and most reliable ... for me. They work every time, using a flame or ferro rod. They're made from a pretty tried an true method - wax impregnated cotton pads. They've been included in a few of the "kits" I've picked up from their store. Bulk (in a plastic bag) and in their snuff tin type container. I've used them everywhere ... wind, dry, rain and darkness. 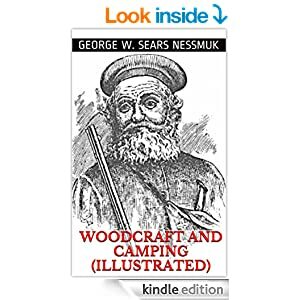 Woodcraft and Camping is a book written by George Washington Sears a/k/a Nessmuk and published in the early 1900s. It is a very interesting account of life in the wilderness, and provides much insight for the person trying to enjoy the outdoors. The book is part instructional, and part a recounting of personal experiences. It is a must read for anyone interested in wilderness living. To the best of my knowledge, the book is public domain, and a copy can be downloaded here,here, and many other locations online. I've used this many times myself, small and large trees and everything in between. Found it to be way better and more flexible than any of the other specialized hangers out there. Zero (unwanted) sag or slippage over multiple nights in my ENO Hunter's Hammock. Just a quick overnight camp out. Minimal equipment and temp dipped to freezing in the early morning! First time for Mrs. Scarecrow in a "Primitive" set up. Not only managed to stay warm, but came to the conclusion "this is the way we should camp all the time!"